In this lesson we’ll learn about regular polygons, what is an exterior angle and what’s the relationship between the number sides of a regular polygon and it’s exterior angle. 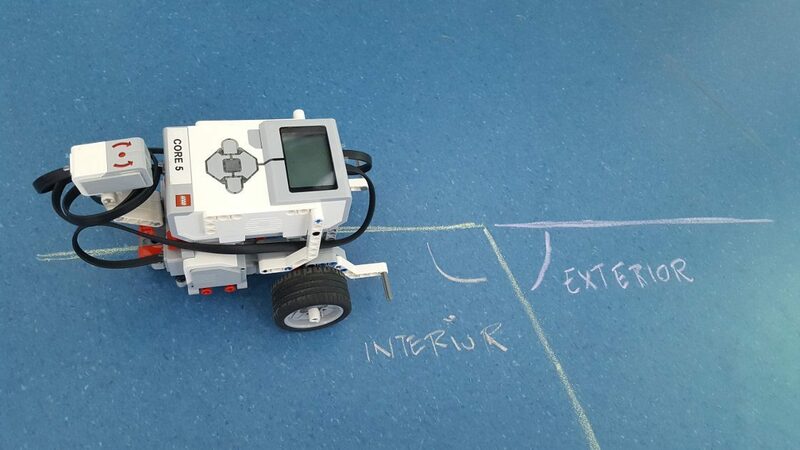 We’re using the Robot Educator Model, equipped with the Gyro Sensor to progressively understand this concepts and build a fully functional model that can track any regular polygon taking the number of sides as an input. Using the Move Steering, Gyro Sensor, Math, Loop and Wait (for Gyro Sensor and Brick Buttons) blocks, as well using variables. Regular polygons are polygons on which all angles are equal in measure and all sides have the same length, such as triangles, squares, pentagons, hexagons and so forth. Let’s first make sure that the students are familiar with these polygons by making them fill a table like shown in the screenshot below. Ignore the exterior angle column for now; we’ll deal with in the next task. Once the students have completed the table with the polygons from the triangle to the hexagon it’s time to move onto the exterior angle. Calculate the sum of the interior and exterior angles. They add up to 180°, hence they are supplementary angles. Now try this: draw a polygon with chalk on the floor, for instance, a square. Put the Robot Educator on one of the corners and push it along the sides. Note how much you turn on each corner… Yes: it’s the exterior angle! Go round the square along the sides, turning on all corners until completing one full loop. You should reach the starting point facing the same direction, which means that all the turns you made add up to a full 360° turn, that is: exterior angle * number of turns = 360. Now that we know how to calculate it, go back to table on the previous task and fill in the exterior (or external) angle for the polygons, before moving into coding. 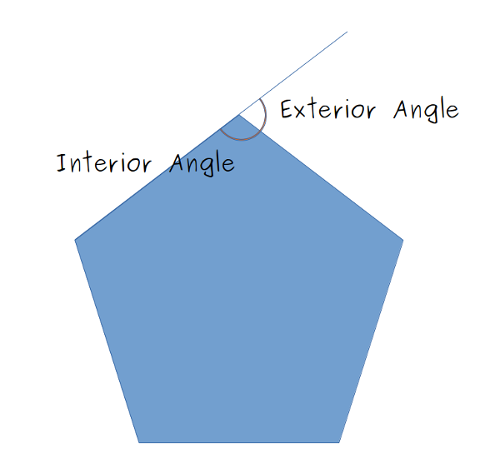 Based on all the facts that we’ve collected about interior and exterior angles in a polygon it should be fairly simple to come up with a similar formula for calculating a regular polygon’s interior angle. Now that we know what’s the value of the exterior angle for a polygon let’s program our Robot Educator for tracking the shape of a triangle and an hexagon using the gyro sensor. Move forward for 2 seconds. Turn right until the angle changes by the exterior angle. 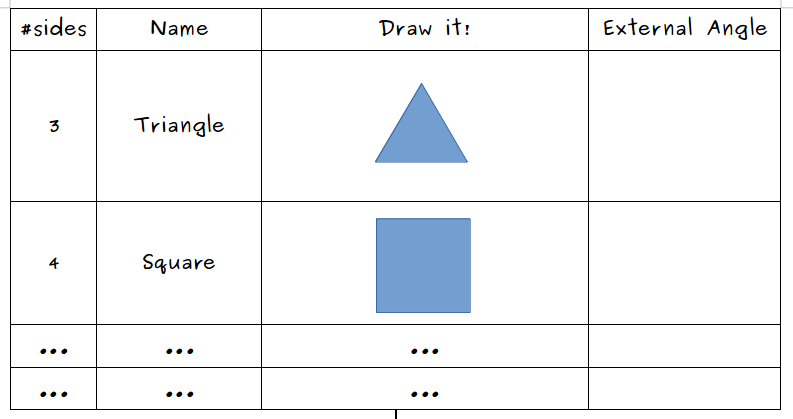 Let’s use the values we’ve previously written down in the table: 120° for triangle and 60° for the hexagon. Keep in mind that the gyro sensor reading lags a little bit, hence the robot will turn a few extra degrees on each corner. A proper way to compensate this lag is outside the scope of this lesson, for now we’re minimizing the impact by turning real slow (power 5). This program is the basic flow we’ll reuse in the following tasks. Did you notice the sole sole difference between the previous two programs? The value of the exterior angle. Wiring the output of the Math Block to the input of the Wait Block. Now that we know how to compute the exterior angle, let’s make our program a little bit more flexible by using variables. In the previous task we used a constant for specifying the number of corners in the polygon. This time we’re going to use a variable for storing it. For debugging purposes and in order to simplify the flow we’ll use a secondary program to display the value of the variable on screen throughout the main program execution. Setting the initial value of the variable to 3, which is the minimum number of corners in a polygon. Waiting for the user to press a Brick Button. Increments the variable when pressing the Up (4) button. Decrements the variable when pressing the Down (5) button. Does nothing on the default case. The loop exits when the pressing the Center (2) button. The variable is then fed to the match block which calculates the exterior angle. One of the questions that usually pops up is: why are we adding all this complexity to the program when we could perfectly live with hardcoding the value in the constant? We can answer that question with another question: Let’s say you programmed your Robot Educator for tracking a square. How would you track an hexagon if you didn’t have your programming environment handy? By making the program runtime configurable we give it more flexibility, at the expense of simplicity. The minimum number of corners in a polygon is 3. Can you modify the program so that the variable can’t be set below this minimum value? Our program is almost complete now, but you’d probably noticed that once we provide the number of corners, the program will run forever tracking the specified polygon. This is nice, but we’d rather track one full polygon and then prompt the user again for providing a new number of corners. In this lesson we learned how to build a somewhat complex program with user input and some maths that helped us better understanding some interesting facts about regular polygons. Feel free to download the full Poylgon Gyro Tracker EV3 project. Stay tuned for more lessons and remember to check my company’s site Tesla Cool Lab for further info and resources.